An initiative at Howard S. Billings High School in Châteauguay on Montreal's South Shore has Aboriginal students sharing stories with elementary school students in the community. This evening at 7 p.m., CBC's Sonali Karnick and Waubkeshig Rice will co-host Turtle Island Reads — a live public event at Kahnawake Survival School, highlighting stories written by and about Indigenous Canadians. You can participate on site or watch live at cbc.ca/montreal and on Facebook. The event in Kahnawake is an opportunity to talk about and celebrate Indigenous Canadian writers and connect readers with their stories. "So you don't live in teepees?" It's a question Ka'hen:ientha Amanda Cross has been asked more than once by a Grade 1 or Grade 2 student, but the 16-year-old Mohawk student, whose father is from Kahnawake, says she doesn't take offence. "They really don't know much about Indigenous people at all," Cross says. 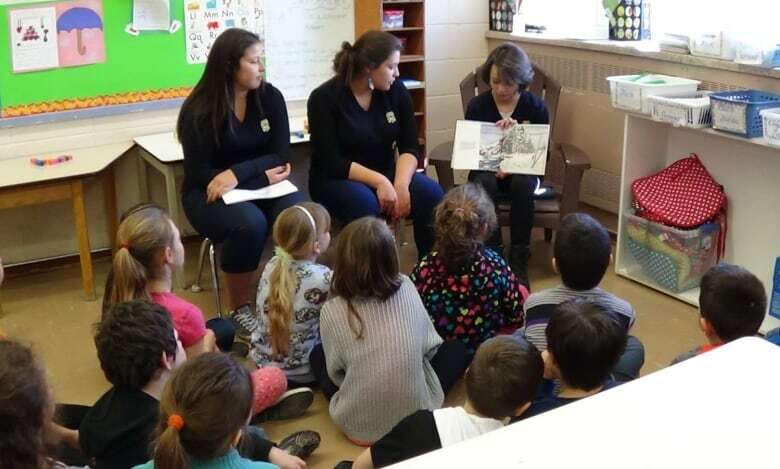 Enlightening the non-native children – and becoming a role model for the younger Aboriginal students she meets – are key reasons why the Secondary 5 student at Châteauguay's Howard S. Billings High School is participating in the school's reading project for a third straight year. The project is the brainchild of Kylie Simard, a resource teacher with the Native education support team at Billings, where one in five students claims First Nations heritage – most of them Mohawk, but many others, as well, including Algonquin, Ojibwa and Cree. Taiosheratie Mayo, Ka'hen:ientha Amanda Cross, and Ashley Deer read a Native book to an elementary school class. (Submitted by: Kylie Simard)Simard asks Indigenous participants in the project to pick a book by an Indigenous author and present it to elementary school students in one of Billings' feeder schools. They plan their own lesson and activity around the book each student chooses. The focus is on literacy – a priority for the New Frontiers School Board – but also on making connections with younger children who have never had any contact with Indigenous culture, Simard says. For the high school students who volunteer, such as Cross, it's also a leadership experience, a way to build confidence and pride in their own culture. 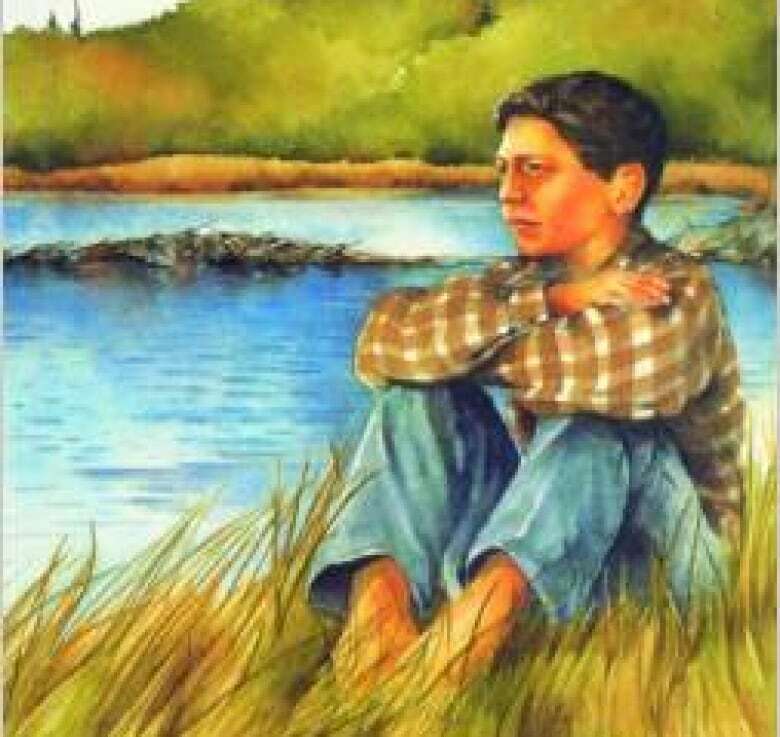 An illustration by Kim LaFave from Shin-chi's Canoe, by Salish/Métis author Nicola Campbell. 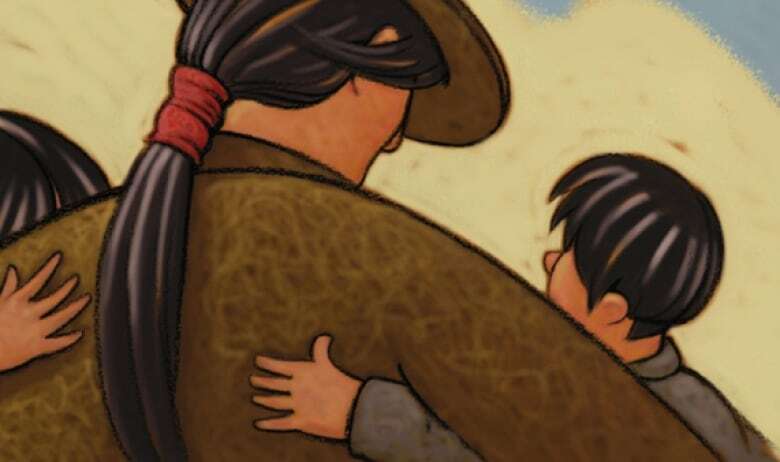 Campbell tells the story of a six-year-old boy heading to residential school with his sister. "They take their 'role model' role very seriously," says Simard. "It's awesome," says Cross about the time spent in the classroom. "Some of the kids in the classes are Native, and the ones who aren't are more informed after we visit." Picking a book can be a challenge, especially when depending on the older books in the high school library, says Simard, who will often spend money from her own pocket to buy newer titles online. "We read books from all over," says Cross, "so [the younger students] know there's not just one group called 'Indigenous people,' but there is Mohawk, Oneida, Inuit..." she said. The first year she participated in the project, Cross chose a book about spirit animals. Last year, she chose a book written by an author in her father's home community of Kahnawake, a semi-autobiographical account of the Oka Crisis of 1990 – the conflict over land and Mohawk sovereignty that Kahnawake was drawn into when Mohawk protesters barricaded the Mercier Bridge in solidarity with the people of Kanesatake, across the Lake of Two Mountains. Cross said she grew up hearing about the crisis, "but because of the book, I learned more about how the people were actually living through it, versus reading about it in a history book or just knowing that it happened." Cross said in high school, she doesn't hear much about Indigenous authors. Her resource teacher and the reading project's instigator, Simard, concurs. In the history curriculum, the role of Aboriginal people is very much in the past tense, she said – basically ending in the 1600s. Hence, there's little taught in school about the fact that Indigenous cultures still exist. It's one of the reasons Cross, who plans to study medicine some day, takes pride in being a role model to younger students, especially those of Aboriginal heritage. "When I go in Grade 1 and 2, I say my Mohawk name, and something clicks," she said. "They go, 'Oh my God, she's just like me. She's Native, too,' and they tell me, 'This is my Native name,' and I say, 'Oh, yeah, what does it mean?' And they love it." "Every time I go to an elementary school, when I'm done doing the reading, the little kids come up to me and hug me." Join CBC's Sonali Karnick and Waubgeshig Rice at Kahnawake Survival School at 7 p.m. tonight to participate in Turtle Island Reads – an event celebrating books by Indigenous Canadian authors. You can also watch live at cbc.ca/montreal and on our Facebook page.